You can find the Soundtrack for The Roosevelts - An Intimate History - A Film By Ken Burns (soundtrack distributed by PBS), Here. In addition, here is an interview with PBS about the project. Here is a piece I composed/played for a performance at Aaron Davis Hall in Harlem - for the opening 2017 season of New York's ADCA. The piece is written as a homage to the elusive, startling, cryptic, scheming, Cassius has a mean and hungry look, Australian Magpie. Under the direction of the inimitable conductor - Tania Leon. The latest soundtrack - released by Ropeadope - for the Ken Burns_Ewers Brothers Productions film on The truly incomparable Mayo Clinic - big shout out to the Mayo gang. We love you - I hope you can hear this in the record. Notes from the Underscore - Ten Years with Florentine Films - - Great Thanks too Ropeadope Records, PBS, and Florentine Films! Released by Ropeadope Records on September 1 2017 - I am really excited to share this music and Yusef's poems as read by him. 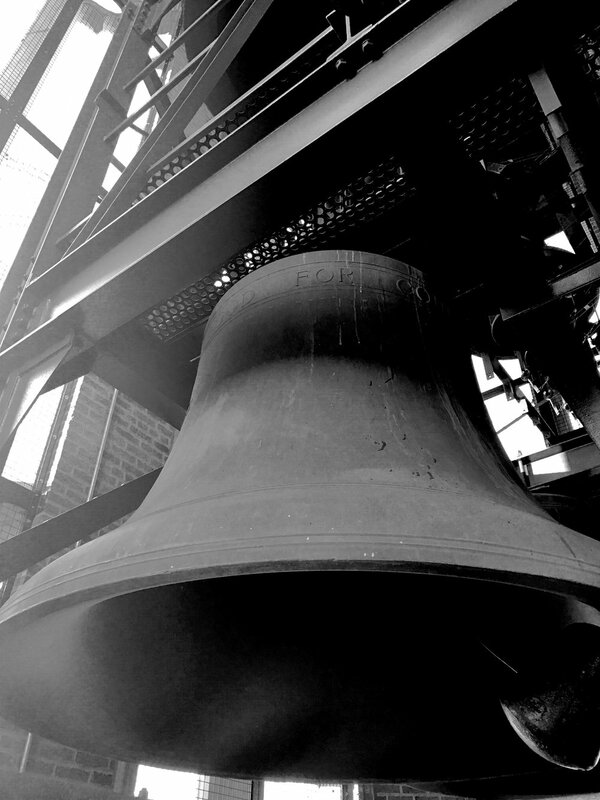 Music written for the worlds largest instrument - Carillon Bells (See Image below of one of the bass bells --Recorded high atop Yale University's Harkness Tower in November 2016 and performed by bellringer Paige Breen), Tam Tam Drum, small choir, waterphone, small string section, electronics, and field recordings captured in Vietnam. The Bells were mastered by Bryan Pugh. Released January 20th 2017. Film Score for the DOCUMENTARY FILM NOT WORKING, in conversation with Studs Terkel's Working in 2011. Rich Hinman (pedal steel), Putnam Murdock (guitars), Rubin Kodheli (cello), Rosa Gilmore (violin), Jay Frederick (drums), DC (piano). Recorded and Mixed by Bryan Pugh at Bunker Studios, Brooklyn NY. Mastered at Blackler Mastering June 2012. A selection from a residency at The Rockwood Music Hall NYC from January - March 2009. Jay Frederick_Bill Mead (drums), Estelle Bajou (violin), Daniel Carter (reeds and horns), Dan Brantigan (flugel horn), Matthew Hamilton (banjo), Aaron Jonah Lewis (violin), Mike Brown (bass), DC Piano - Thanks Ken and The Rockwood Music Hall.